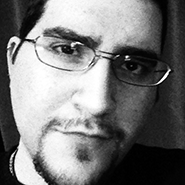 … So, What Are Variables? In the most simplistic terms, variables are ‘things that can change’. In programming, variables can be anything from a number, text, colour, or some other custom type of data. 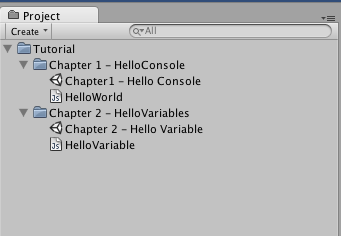 Another very important aspect, (specifically in Unity) is that variables can be used to make a script far more versatile! If you remember, this simple script sends a message to the console with the text “Hello Console!” (in programming terms, “Text” is called a “String”). What we’re doing here is setting up a variable called “printText“. 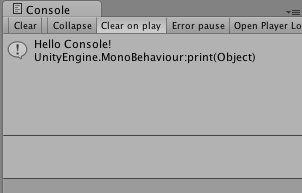 All variables in Unityscript have to start with the word var to let the system know that what we are doing is in fact setting up a new variable. The second part is the name of the variable, followed by a “:”, which means we are about to tell the compiler what kind of variable this is. As we are storing text, we want to use a “String” type. We could put the semicolon (;) there to close the statement if we want, but we’ve also added a value for this variable ( “Hello Console!” ). It’s important to note that this particular variable has been created OUTSIDE of any function. 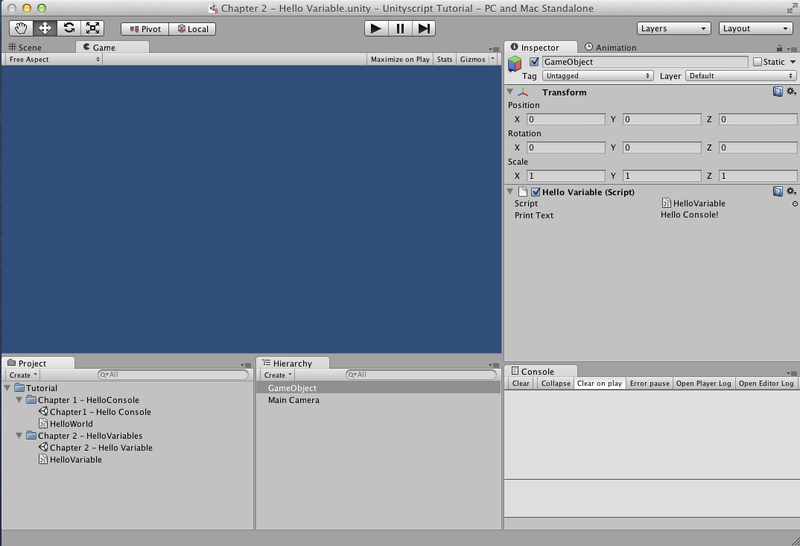 This means it will be available in the Unity inspector pane. You’ll soon see why this is super cool! The next change in this script is in the print() function, where we add the variable instead of a predetermined piece of text (remember, they’re called Strings!). What we’re doing here is using the value of the printText variable to be sent to the console. 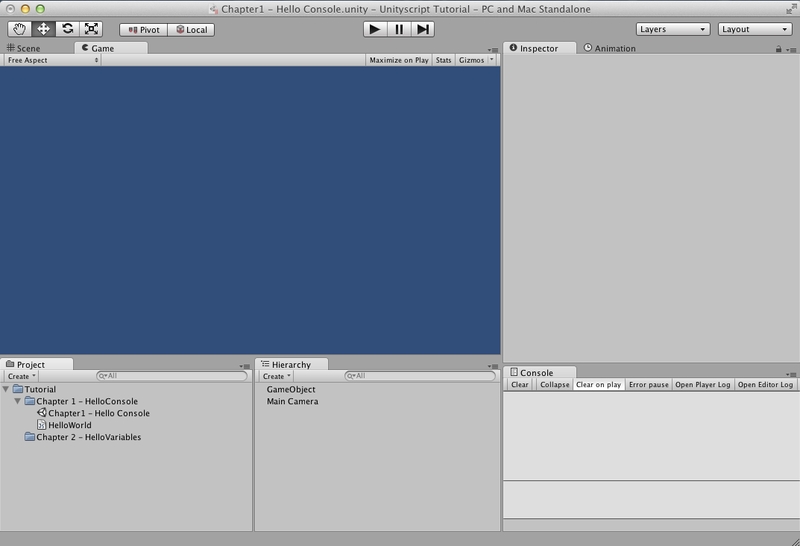 It is acting kind of like a “placeholder” for anything we’ve set the variable to. Hopefully you’ve noticed something really cool! 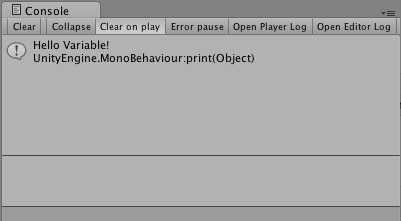 Now, let’s go ahead and change the variable in the inspector to “Hello Variable!”. We’ve only just touched on the basics of Variables (in theory anyway), but what we have learned is HOW to create them, and HOW to put them to good use! We expanded our old script with a single variable which instantly made it a lot more flexible! For example, rather than creating 10 different variations of the same script with 10 different console messages, now we have 1 script which we can use to create infinite variations (via the editor)! Variables are a complicated subject, and in the next chapter we’ll be building up our knowledge of them even further!